The field of scientific visualization is changing as rapidly as the computational landscape. Tools, techniques, and algorithms that were born in the 1970s and 1980s—the era of the serial processor—have undergone a rapid evolution over the past two decades to make effective use of emerging multi- and many-core computational platforms and to accommodate an explosive growth in data size and complexity. Our objective was to bring together experts in the field to create a reference work that provides an in-depth introduction to the interaction of two highly important and relevant topics in computational science: high performance computing and scientific visualization. 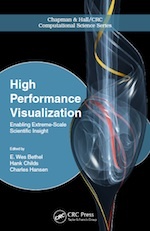 Cover artwork for the new book, High Performance Visualization, published by CRC/Taylor & Francis in 2012, and part of the Chapman & Hall, CRC Computational Science series. The result of this effort is an edited book  entitled High Performance Visualization, which focuses on the subset of the broader field of scientific visualization concerned with algorithm design, implementation, and optimization for use on today's most advanced and largest computational platforms. It provides, for the first time in book form, a background on the topics of high performance visualization and high performance computing, and describes some of the most recent developments in scientific visualization as we move from the Petascale era to Exaflops computing. Collectively, the chapters in this book aim to organize and articulate a large and diverse body of computer science research, development, and practical applications. The chapter themes reflect major conceptual thrust areas within the field of high performance visualization. E. Wes Bethel, Hank Childs, and Charles Hansen, editors. High Performance Visualization—Enabling Extreme-Scale Scientific Insight. Chapman & Hall, CRC Computational Science. CRC Press/Francis–Taylor Group, Boca Raton, FL, USA, November 2012. E. Wes Bethel, Hank Childs.